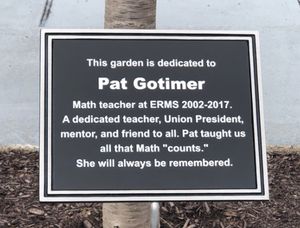 A beautiful garden at East Ridge Middle School (ERMS) has been created and dedicated to beloved math teacher and Ridgefield resident, Pat Gotimer who worked at the school from 2002 to 2017. The garden is the brainchild of one of Pat's students who benefited from her tutelage. “When my mom passed in 2017, Tommy Keaveny was one of her 8th-grade students at ERMS,” says Lauren Gotimer, Pat’s daughter. 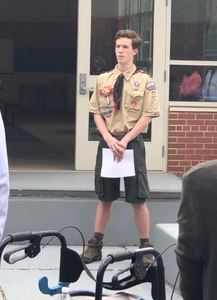 Now a sophomore at Ridgefield High School, the garden is part of Keaveny’s Troop 76 Eagle Scout Project. 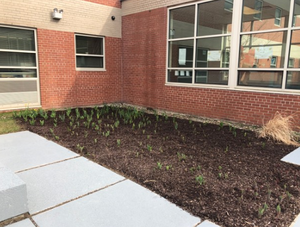 “At the celebration of life for my mom in March 2017, Tommy presented an idea for his Eagle Scout Project - a memorial garden at ERMS for my mom,” Lauren says. 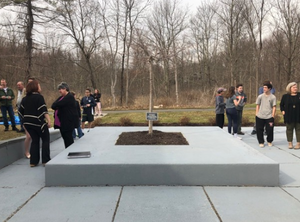 In addition to Pat’s family, many attended the dedication ceremony and reception on Monday, April 8, including current and retired ERMS teachers, administrators, Ridgefield Police officers, and former students. Sharing heartfelt words about their colleague and friend were ERMS Principal, Patricia Raneri, Barbara Loshe, and Lourdes Eckstein along with Lauren Gotimer and garden mastermind and Pat’s former student, Tommy Keaveny. The ceremony concluded with unveiling the plaque dedicating the garden to Pat Gotimer.